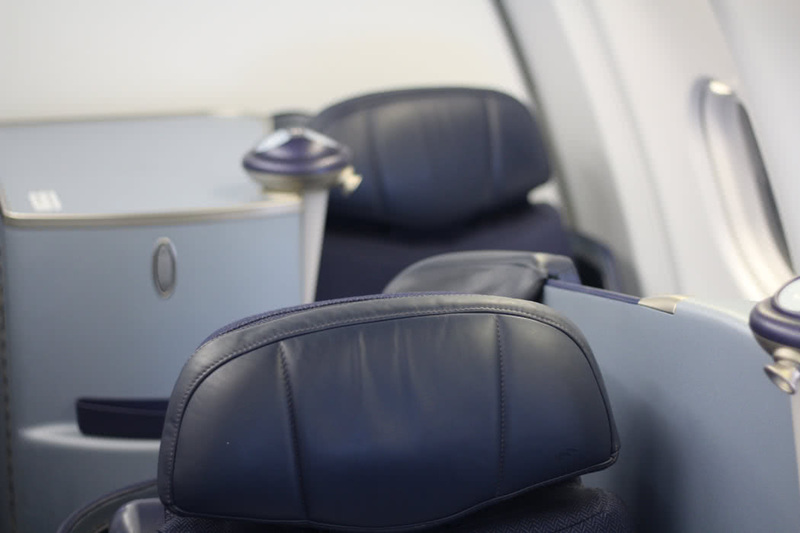 $128 RT For 6 Hours Lie-Flat Business Class & 3,000 American AAdvantage Miles! 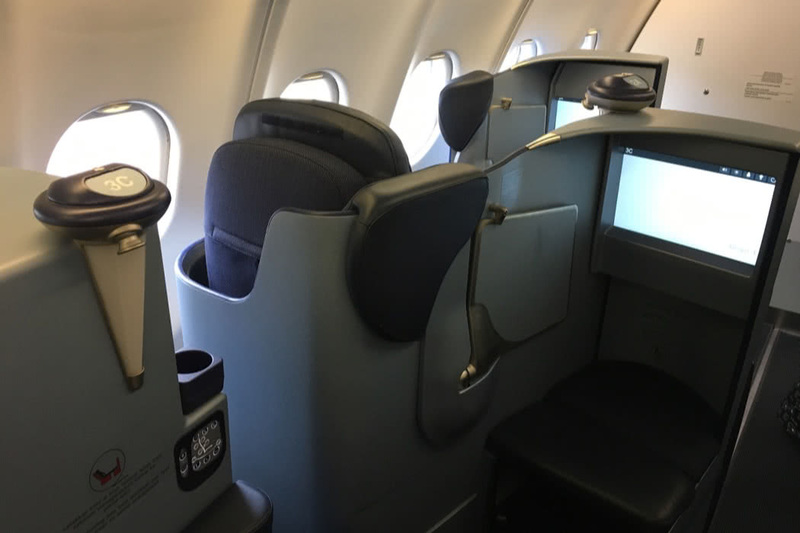 In this review, I share how I managed to fly in Business Class for $128 return in lie flat Business Class AND snag 3,000 American AAdvantage Miles. My flights were on Malaysia Airlines from Bali to Kuala Lumpur and then back on the airline Lion Air. 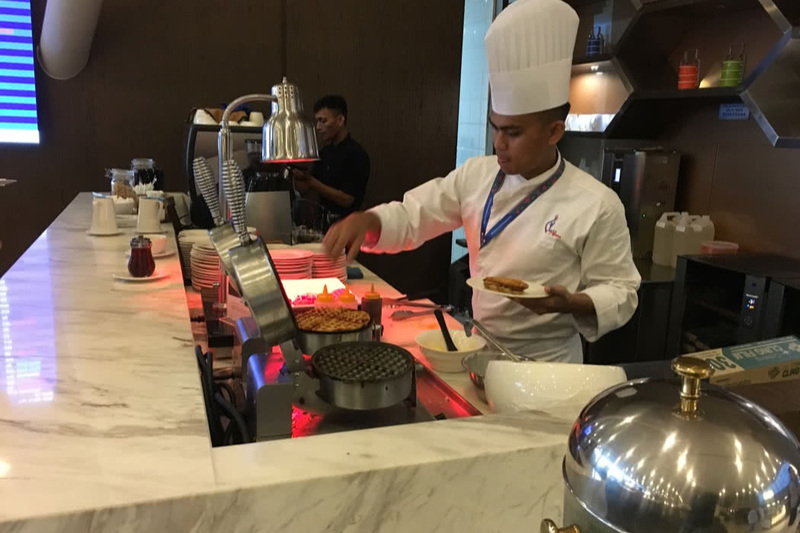 I also review the airport lounges at Denpasar airport and at Kuala Lumpur airport. 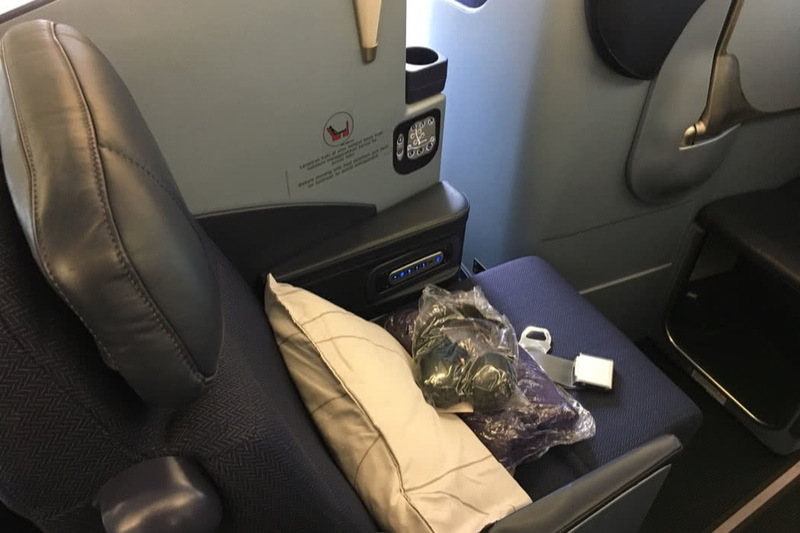 Just a few months ago Malaysia Airlines Mighty Travels discovered and alerted subscribers to wonderful Business Class fares for just $128 Round Trip between Denpasar (Bali), Indonesia and Kuala Lumpur, Malaysia. This is an incredibly low fare in the first place and even would be considered a good Economy Class fare. It was such a great deal and didn’t involve messing around with airline miles. It was a simple, book it before it’s gone rate. Since these mistake fares and crazy deals are so hard to predict and are bookable only for a few minutes or hours at a time, you will need a dedicated service like Mighty Travels Premium to be notified of this kind of rate. Mighty Travels Premium which specializes in heavily discounted fares and mistake fares (up to 90% off!). Get a FREE trial here. 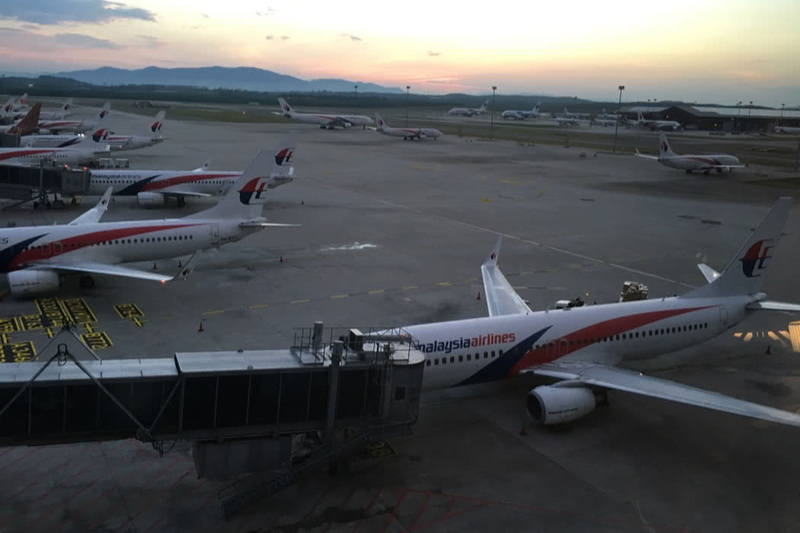 It gets even better since Malaysia Airlines operates some of these flights with an A330 wide-body that features the international lie-flat product. These fares ALSO earn 100% miles with AAdvantage making this deal even more valuable. 3,000 AAdvantage miles are valued typically at $50 and these miles also help to gain status win any Oneworld program you are collecting miles with. Of course, this fare also comes with lounge access (valued at ~$20 each time you access a lounge), two bags and Business Class catering and alcohol. So according to my calculation (bear in mind that I’m an optimist! ), this $128 fare minus $50 of miles minus, say $20 lounge means the flight itself was only $58! Wherever you fly to, if you want to book a hotel, use our luxury travel concierge. We offer free upgrades, free breakfasts, free hotel credit and VIP gifts at major luxury hotel brands like Four Seasons, Hyatt, Belmond, Ritz Carlton, InterContinental, Starwood and more. So how did this actually work? 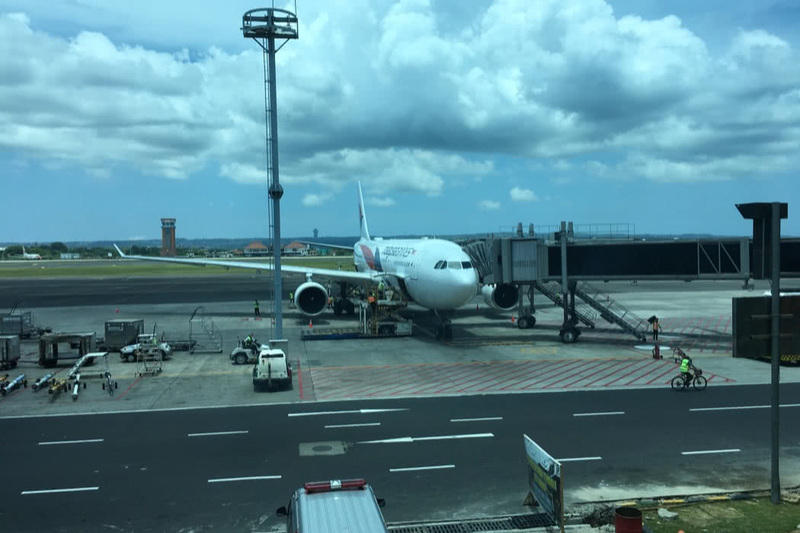 My experience flying Malaysia Airlines in Business Class for just $128 Round Trip in Business Class lie-flat to Kuala Lumpur was excellent! 48 hours before departure I got an email and checked-in for my flight online. Malaysia Airlines uses the check-in system provided by GDS giant Amadeus. It works well. A few minutes later I had my electronic boarding pass. Bali airport allows electronic boarding passes. Bali airport can be crowded with many flights to China mainland, especially at night, but my experience was rather peaceful for this midday departure. Unfortunately, a major holiday was approaching, so flights were expected to be full 100% leaving the island (including my flight). There is no Oneworld or Malaysia Airlines dedicated lounge at Denpasar airport. The Premier Lounge is also accessible for Priority Pass members and this is my least favourite lounge at Denpasar airport. It is often crowded, has just barely edible snacks and simple drinks. The neighbouring T/G lounge is quite a bit better (that’s where I ended up). Boarding was late due to the late arrival from Kuala Lumpur but just by a few minutes. Malaysia Airlines follows a priority boarding concept but it isn’t exactly well enforced with multiple lines going all over the boarding gate area at Bali airport. 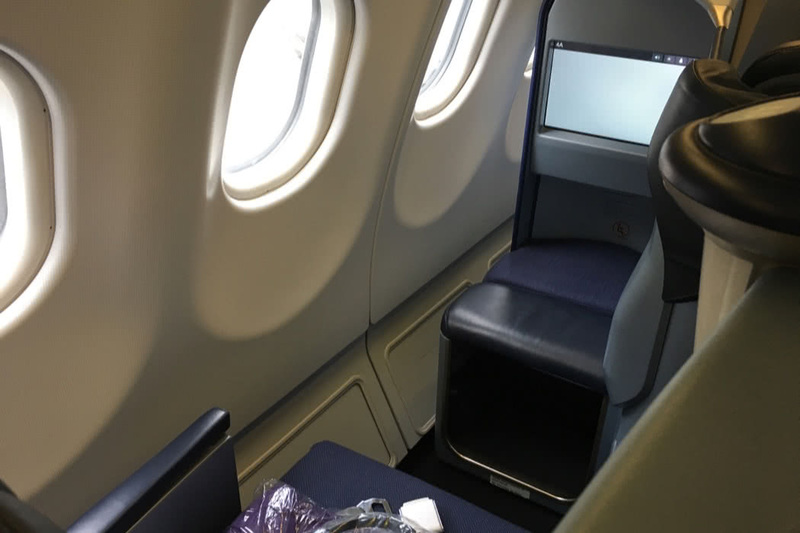 The Business Class cabin featured the brand new lie-flat Business Class that looks much like the Stelia SOLSTYS product. You will notice how some seats open into the aisle and others are well protected and you need to slip into your seat through a small opening. You had better be flexible and skinny to squash yourself into your seat especially if it is in lie flat mode. The cabin filled up right away and felt a bit cramped in the aisles. A family with a young child was immediately behind me and unfortunately not every member of the family was positively excited about flying. The flight attendants informed me that some of the entertainment displays would not work in the cabin and apparently my seat was affected by it. The whole left side of the plane would have that problem eventually. The flight attendants were warm and did their best to serve pre-departure drinks and newspapers while the Economy Class cabin filled with passengers. While a rainstorm approached Bali airport but we immediately took off on power in the other direction, avoiding most of the seemingly enormous rain. The flight proved rather turbulent because of the seasonally humid weather that we had to battle for the next two hours. Just a few minutes after take off the flight attendants took drinks and food orders. I decided to try all two white wines and champagne. I wasn’t a fan of the champagne but liked the white wines a lot with their fresh, citrus-infused taste. 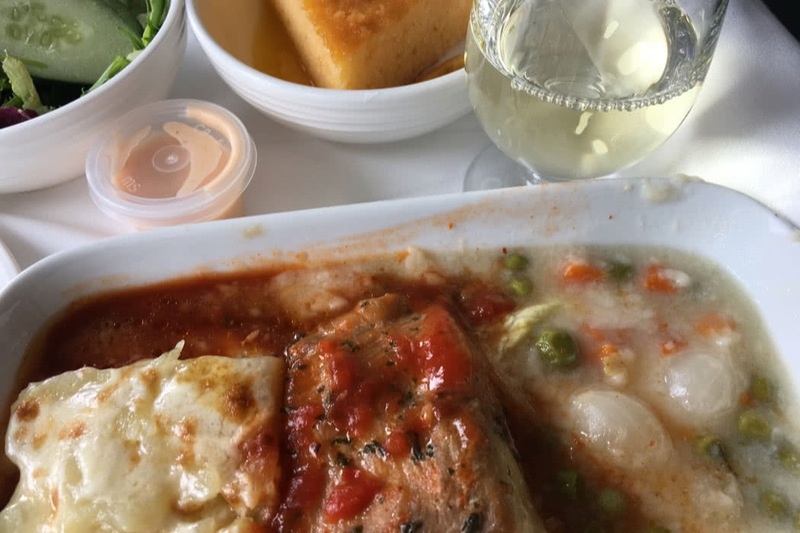 I wasn’t so much a fan of the meals served – maybe it was just my taste buds? 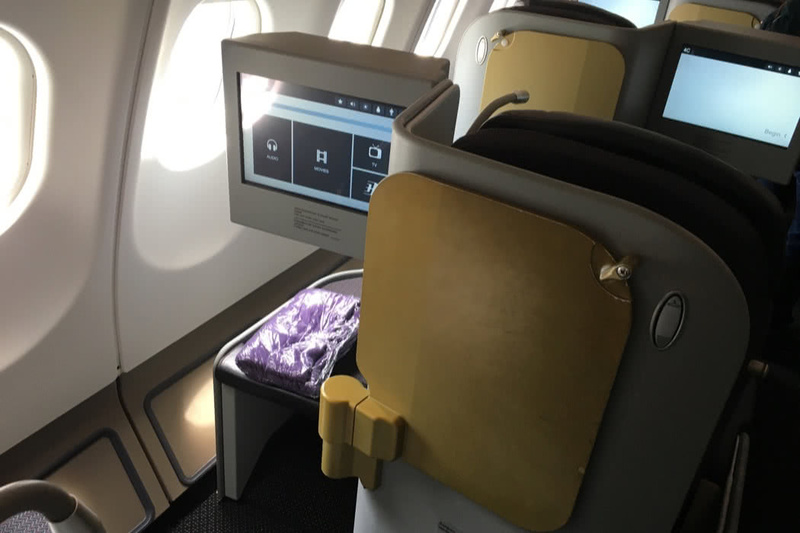 The lie-flat seats proved very helpful for the next almost three hours as I was able to go into a sleep mode for the next two hours. The constant rocking help put me to sleep rather quickly. I wasn’t able to fully stretch out but I was able to lie down comfortably on my side. Our arrival into Kuala Lumpur was right on time and immigration was a breeze thanks to the dedicated Business Class lanes that the airport provides (and Malaysia Airlines pays for). My miles posted just 48 hours later with American Airlines! Just a week later it was time for me to take my return flight back to Bali. 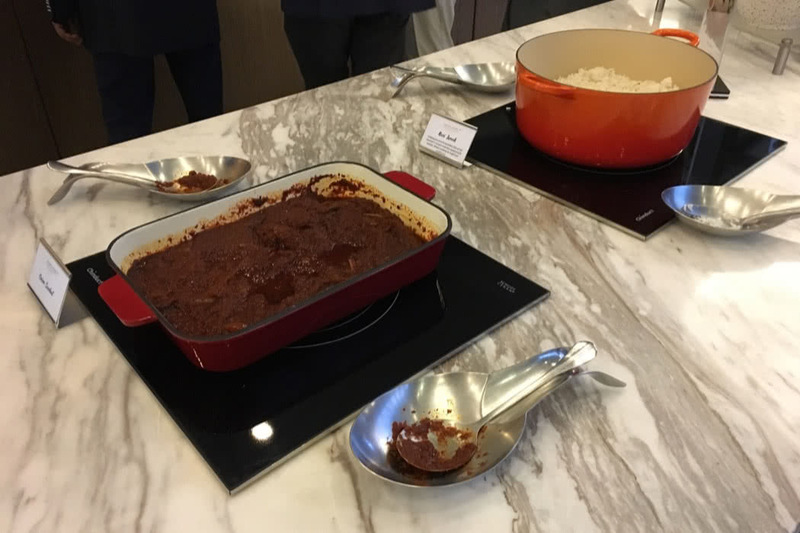 Malaysia Airlines has recently upgraded the catering in their Golden lounges and now features dedicated baristas and premium food. 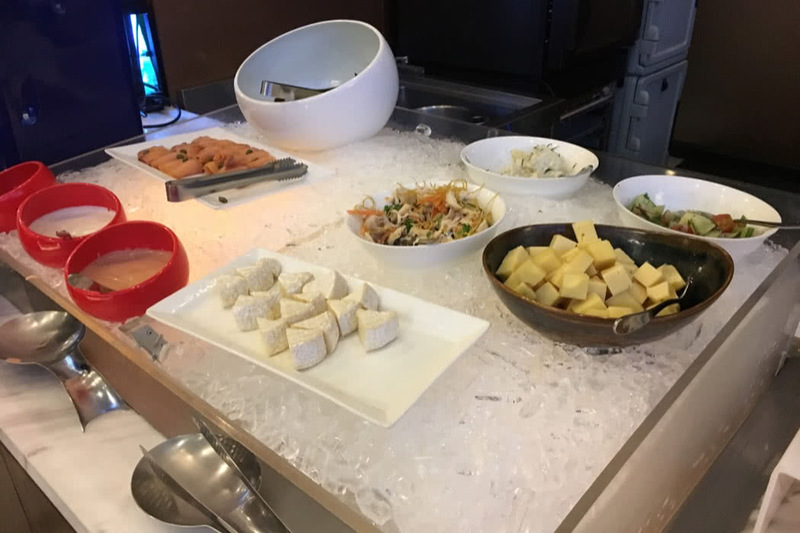 While breakfast is usually the most difficult meal for airline lounges to do well, I was quite impressed with my custom made espresso drink, smoked salmon, fresh fruit, different curries and a great cheese selection. 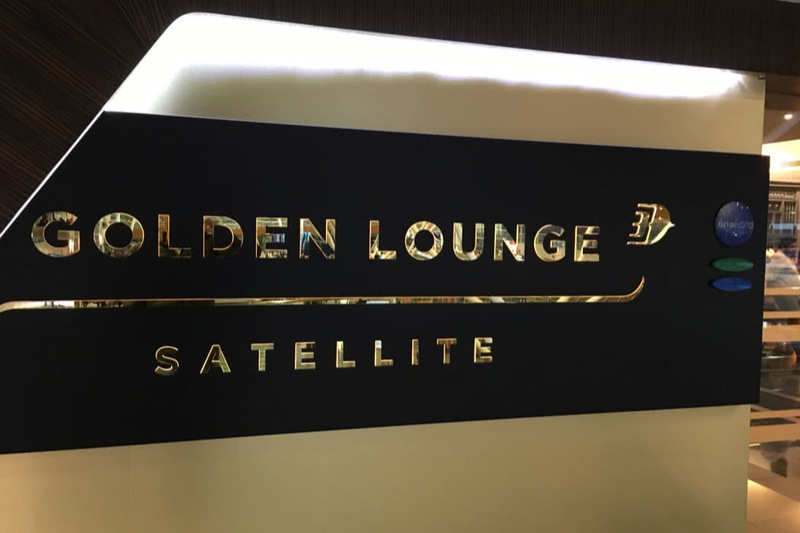 There are two lounges, one for regional and one for long-haul flights that you have access to. They feature the same food menu but the latter has much more space. Kuala Lumpur runs security at the gate and our gate was a dual gate with a full Lion Air flight, the crowds were rather menacing and boarding chaotic with multiple announcements talking over each other did not help. Once aboard a slightly different lie-flat cabin awaited. It was seemingly older but looked strikingly similar to the plane I just flew a few days ago. Again the entertainment system on the left side of the plane would not work (but in the middle and on the right would). Right behind me would be another unruly toddler, just as in my earlier flight. To make this even more spooky the flight attendants were the same crew (almost) as with my flight a week ago. This time service was less rushed. I actually decided to skip the meal service (i had eaten way too much at the lounge) and fell asleep quickly. 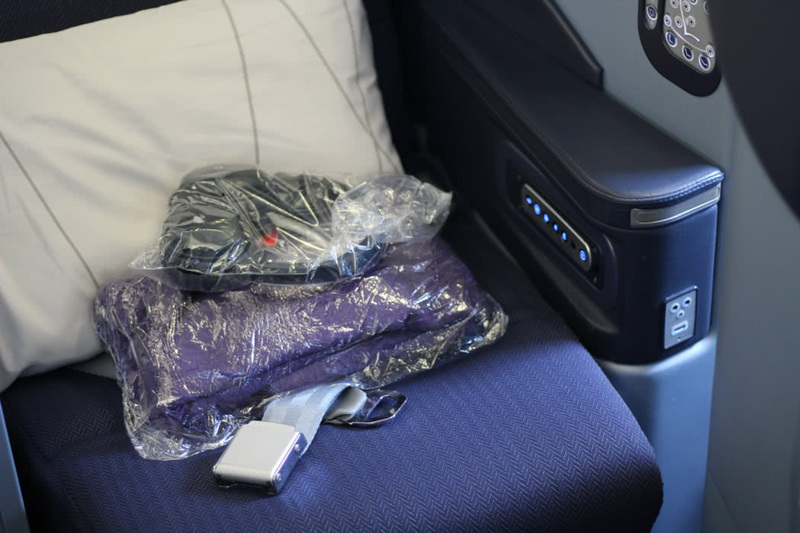 The seat was perfect for a nap – though I felt it would be a bit cramped for a long-haul flight exceeding 8 hours. We arrived on -time in Bali and I was on my way to the beach 30 minutes later. In summation, I liked my flights and found them incredible value. 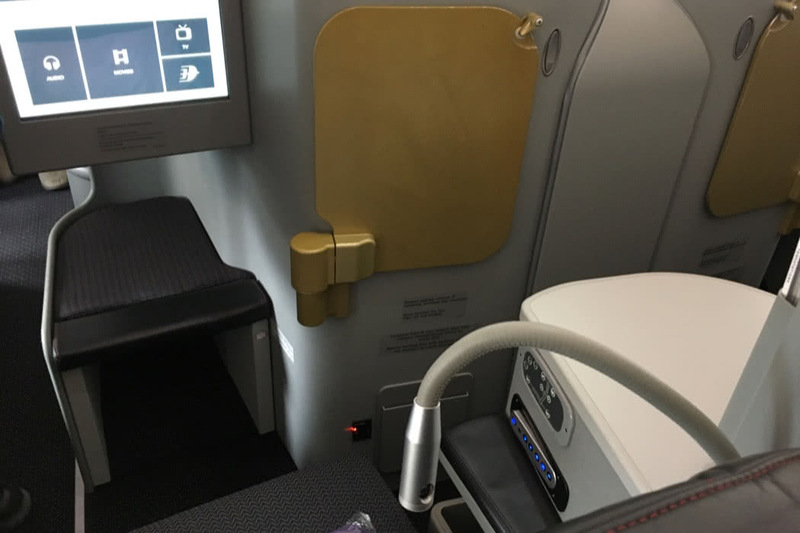 I got a comfortable, even luxurious seat and earned miles worth $50. 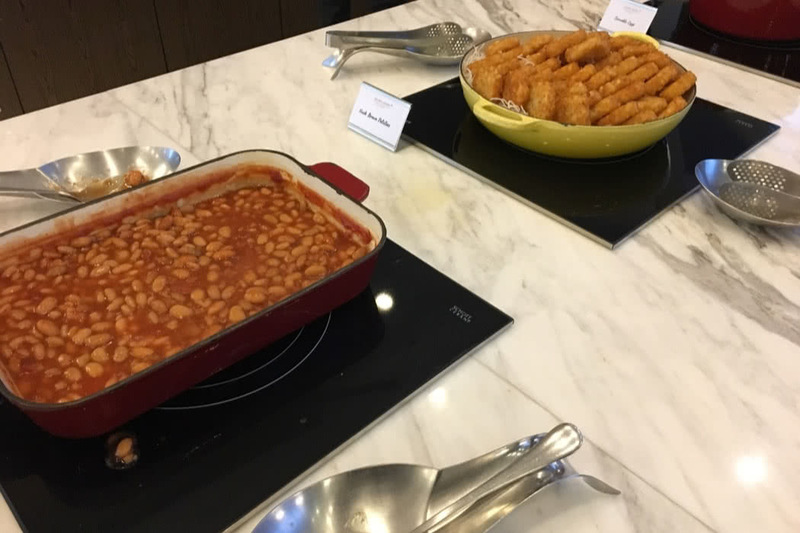 I loved the lounges in Kuala Lumpur but wasn’t a fan of the catering onboard. The flight attendants were jovial and friendly and I liked the idea of doing a little wine tasting while flying. If flying would always be that much fun (and such a good deal). I’d do it all the time (that’s what I do! ).